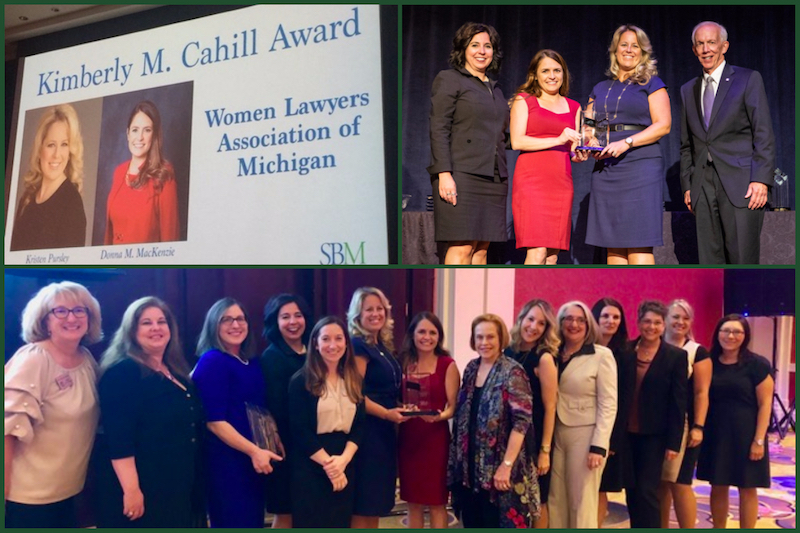 The Women Lawyers Association of Michigan (WLAM) has won the Kimberly M. Cahill Bar Leadership Award for 2018. This award symbolizes excellence in promoting the ideals of professionalism and equal justice for all. Accepting the award at the State Bar of Michigan Awards Banquet was the Women Lawyers Association of Michigan Foundation‘s (WLAM Foundation) President Kristen Pursley, attorney and shareholder at The Dobrusin Law Firm, and WLAM President Donna MacKenzie of Olsman, MacKenzie, Peacock & Wallace. This award is established in memory of Kimberly M. Cahill, president of the State Bar of Michigan (2006-2007). Her volunteer leadership efforts in state and local bar organizations included serving as chairperson of the Representative Assembly, president of the Women Lawyer’s Association of Michigan, and president of the Macomb County Bar Association. In 2018, WLAM celebrated 100 years of supporting its mission of securing the full and equal participation of women in the legal profession in furtherance of a just society. Since 1997, the WLAM Foundation has awarded over $610,500 to 252 outstanding women law students attending Michigan law schools. The Foundation will be giving out $35,000 in scholarships this year – including a scholarship endowed by The Dobrusin Law Firm.